Security forces stand near a tourist bus after a roadside bomb in an area near the Giza Pyramids in Cairo, Egypt. A roadside bomb hit a tourist bus on Friday near the Giza Pyramids, killing three Vietnamese and their Egyptian guide, officials said. 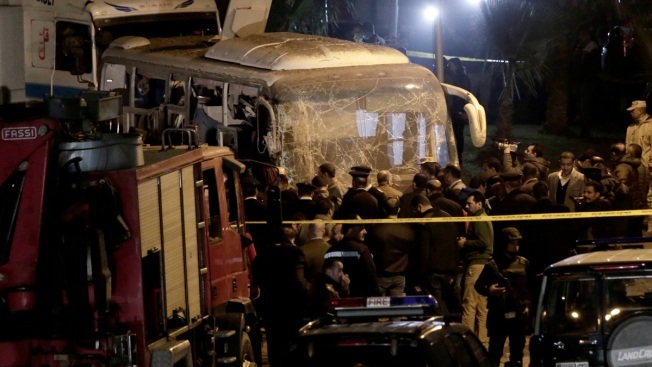 The bus was traveling in the Marioutiyah area near the pyramids when the crude roadside bomb, concealed by a wall, went off, Egypt's chief prosecutor Nabil Sadeq said in a statement. The blast wounded 11 other Vietnamese tourists as well as the Egyptian driver. The bus was carrying a total of 15 Vietnamese tourists, according to Vietnam's Ministry of Foreign Affairs. It said that 10 were seriously injured. Vietnamese Ambassador to Egypt Tran Thanh Cong visited the scene of the attack and Al Haram Hospital, where the victims were being treated, the ministry said. Egypt has battled Islamic militants for years in the Sinai Peninsula in an insurgency that has occasionally spilled over to the mainland, hitting minority Christians or tourists. However, this is the first attack to target foreign tourists in almost two years. The attack takes place as Egypt's vital tourism industry is showing signs of recovery after years in the doldrums because of the political turmoil and violence that followed a 2011 uprising that toppled former leader Hosni Mubarak. It will likely prompt authorities to further tighten security around churches and associated facilities ahead of the New Year's Eve celebrations and next month's Christmas celebrations of the Coptic Orthodox Church, the dominant denomination among Egypt's estimated 10 million Christians. Over the past two years, militant attacks against Christians in Egypt — usually targeting churches or buses carrying pilgrims to remote desert monasteries — have killed over a hundred people.